It’s true, we do love Summer. Enjoy the video, and check out more of Summer Glau in the March issue of Esquire in print and online at Esquire.com. 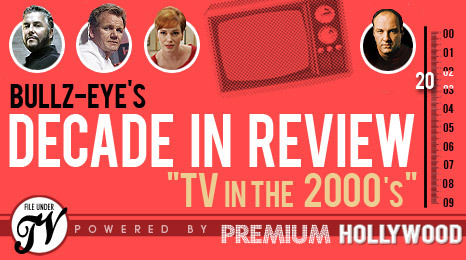 Together with the editors of Premium Hollywood and The Scores Report, Bullz-Eye.com is looking back at the past decade (what the hell should we call it?) and compiling lists of some of the best and worst of the 00’s in television, movies and sports. These decade debates are fun, so feel free to leave comments with your perspectives as well as we’ll be featuring them here in the Bullz-Eye Blog. The T-1001 wasn’t the only Terminator to get a crash course in humanity during Season 2. Cameron (Summer Glau) spent much of the season suffering from a serious chip malfunction, leading her at one point to adopt the approximate memories of future resistance fighter Allison Young, on whom her personality had originally been patterned, but we also saw her interacting outside of the Connor camp; elsewhere, the Terminator formerly known as Cromartie (Garret Dillahunt) had his chip destroyed, but his body was connected to ZeiraCorp’s artificial intelligence known as the Babylon A.I., leading him to take on a new name – John Henry – and leading the series to explore matters of spirituality by querying whether his sentience means that terms like “life” and “death” now apply to him. Oh, right, and there was also some pretty good stuff with the human characters, too. Sure, there were moments which defied credibility, but when you’re dealing with a show that lives and dies by time travel, suspension of disbelief and acceptance of pretty much everything that’s handed to you is a necessity. Fortunately, executive producer Josh Friedman found a way to combine the necessary technological components of “Terminator” with deep characterization. It seriously sucked that “The Sarah Connor Chronicles” was canceled just as those who’d followed it from the beginning were really feeling rewarded for their steadfast viewership, but it was just insult to injury when “Terminator: Salvation” bombed, taking down any decent chance that the series might be revisited at some point. We have to admit that Lena Headey and Summer Glau added an eye candy factor that made the shows even more enjoyable. Both of their characters found their way onto our TV Girlfriends feature, with Lena’ Headey’s Sara Conner featured in our Married to the Job category and Summer Glau’s Cameron battling in our Fox Force Five list.